It is always pleasant to hear that a band that has been long broken up gets together again to record an album. 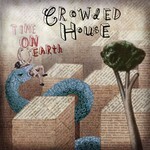 For Australian fans of pop-rock band Crowded House it twice that pleasant for initially Australian bands are not at all numerous nowadays. The band was formed in the middle of 1980s and broke up n 1996, and its most worldwide known song is Don't Dream It's Over, which has been covered an immense number of times. At first front man Neil Finn was going to record another solo work (the third after Try Whistling This and One Nil), but later decided to reunite the band, that is himself, bassist and back vocalist Nick Seymour and guitarist and keyboardist Mark Hart. After drummer Paul Hester's death in 2005 drummer Matt Sherrod came from Beck. Last year the musicians released a collection of rarities on CD and DVD Farewell To The World, and this year an absolutely new creation Time On Earth is being put out. As usually Neil Finn has written most of the new album's fourteen songs, and all of them are characterized by that ethereal sounding for which everybody adores Crowded House. The musicians' experience has found reflection in a more many-sided instrumental background and in the deeply philosophic lyrics. Rather a large number of compositions on Time On Earth are devoted to the band's departed member Paul Hester and other themes include lost love and despair. As for the tunes all of them are at the same time original and sounding like real classics. The album opens with an amazingly melodious track Nobody Wants To, and next comes the lead single Don't Stop Now, which is sure to become a new hit due to its great hooks and spectacular guitar playing. She Called Up and Even A Child are refined with a great drum work, and the beautiful melody of track Pour Le Monde reminds of classic John Lennon's creations, with piano adding to the effect. A Sigh is another unforgettable slow composition with soft guitars, and song Silent House, co-written with Dixie Chicks, is refined with a multilayer accompaniment. Metaphors of English Trees speak of Neil Finn's evolving ability to write great texts, and the growing rhythm of Walked Her Way Down combined with glorious musical effects are sure to give you the creeps. Track You Are The One To Make Me Cry is refined with the front man's splendid falsetto on chorus and the final song People Are Like Suns is the representative of the most unusual sounding that Crowded House could possibly provide. New and surprisingly familiar album Time On Earth can be listened to an endless number of times and one will never get tired of it. The latest album of Crowded House named Together Alone was released fourteen years ago, and a lot of changes have happened during that time. Judging by the lyrics of the songs on Time On Earth, it is clear that Neil practically has had to rethink his world outlook. Besides the close friend's death could not help leaving a scar in the soul of every band member and the melancholy of the new album is the best confirmation of it. Nevertheless Time On Earth has become an enormous present for all the Crowded House fans, of which during all these years there has gathered a whole army. Naturally they did not have to feel bored – Neil Finn's solo works pleased them in their time, however despite all his talents the difference from Time On Earth is obvious. The musicians' matched playing, the back-vocal's support, flawless audio effects – all this and many other factors make the hearts of listeners beat faster. The tunes performed by such an experienced collective gain an utterly different sounding, allowing your imagination to create most fantastic pictures. That is why one cannot but agree that an album recorded so many years after the band's break-up bears an immense value, and we are really lucky that Crowded House music goes on living and becoming perfect.